The Other Side of Will: Daylight Savings Time: A Time for Lunacy? 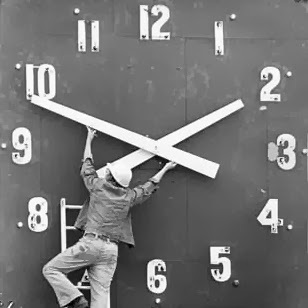 Daylight Savings Time: A Time for Lunacy? Once again it’s that time of year where many of us get to run all around the house changing clocks. Maybe one of these years I will actually remember how to change the clock in my car (groan). Thankfully our smart phones and computers automatically do the changing for us. If you ask me (and even if you didn’t), Daylight Savings Time is nothing but a waste of time! Why doesn’t everyone observe it? I like to think that it’s because there are still some politicians out there who also know that Daylight Savings Time is a waste of time. I like to think that there are still some powers that be who aren’t easily bullied into following the status quo of forcing this useless little exercise on the rest of us. If I wanted exercise, I'd go to the gym. I’m sure that we’ve all heard some of the arguments in favour of DST, such as the energy savings that we will be able to enjoy as a result of it. Proponents of this madness would have us to believe that if we advance our clocks during the months that are already lighter, we would have more daylight in the evenings and less in the mornings. While some studies have claimed to prove this saves energy, others have disproved it by showing that the reverse is actually true due in large part to an increased use of air conditioning and other appliances. Then there are those, like me, who have long since forgotten what it means to sleep in and who typically wake up earlier than most. Since there is now less daylight in the early morning, thanks again to the DST, we burn more energy in the mornings through the use of more artificial lighting. "Early to bed, early to rise," said the old maxim. Unfortunately, sometimes all that extra light means that it's harder to get to bed earlier, because we've insisted on manipulating the natural created order of time. And then there’s the toll that all this nonsense plays on our internal clocks. Who hasn’t suffered the effects of that? As someone has jokingly suggested, maybe the real truth in DST is that the whole thing is nothing more than a conspiracy by the coffee companies to get us to buy more coffee. Hmm. So if we’re going to continue with this lunacy of bi-annual Time Travel, I wish someone would figure out a way to make it worthwhile by changing the clocks back 24 years instead of only 24 hours. Now that would be interesting; take DST to the next level and make it sort of like a reset button on life. Well there you have it, my Daylight Savings Time rant. You May Also Want to See: Time: The Great Obsession. A post from my other blog.